The new ALMA observations reveal that the protoplanetary disc surrounding the young star MWC 480  contains large amounts of methyl cyanide (CH3CN), a complex carbon-based molecule. There is enough methyl cyanide around MWC 480 to fill all of Earth’s oceans. Both this molecule and its simpler cousin hydrogen cyanide (HCN) were found in the cold outer reaches of the star’s newly formed disc, in a region that astronomers believe is analogous to the Kuiper Belt — the realm of icy planetesimals and comets in our own Solar System beyond Neptune. Comets retain a pristine record of the early chemistry of the Solar System, from the period of planet formation. Comets and asteroids from the outer Solar System are thought to have seeded the young Earth with water and organic molecules, helping set the stage for the development of primordial life. “Studies of comets and asteroids show that the solar nebula that spawned the Sun and planets was rich in water and complex organic compounds,” noted Karin Öberg, an astronomer with the Harvard-Smithsonian Center for Astrophysics in Cambridge, Massachusetts, USA, and lead author of the new paper. “We now have even better evidence that this same chemistry exists elsewhere in the Universe, in regions that could form solar systems not unlike our own.” This is particularly intriguing, Öberg notes, since the molecules found in MWC 480 are also found in similar concentrations in the Solar System’s comets. 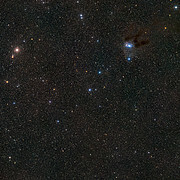 The star MWC 480, which is about twice the mass of the Sun, is located 455 light-years away in the Taurus star-forming region. Its surrounding disc is in the very early stages of development — having recently coalesced out of a cold, dark nebula of dust and gas. Studies with ALMA and other telescopes have yet to detect any obvious signs of planet formation in it, although higher resolution observations may reveal structures similar to HL Tauri, which is of a similar age. 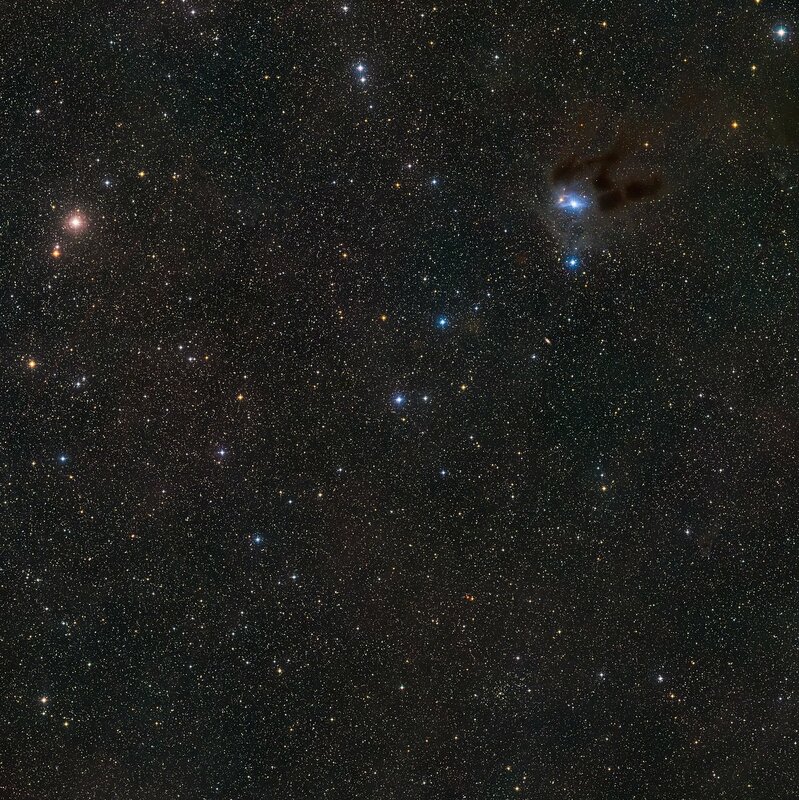 Astronomers have known for some time that cold, dark interstellar clouds are very efficient factories for complex organic molecules — including a group of molecules known as cyanides. Cyanides, and most especially methyl cyanide, are important because they contain carbon–nitrogen bonds, which are essential for the formation of amino acids, the foundation of proteins and the building blocks of life. Until now, it has remained unclear, however, if these same complex organic molecules commonly form and survive in the energetic environment of a newly forming solar system, where shocks and radiation can easily break chemical bonds. By exploiting ALMA’s remarkable sensitivity  astronomers can see from the latest observations that these molecules not only survive, but flourish. 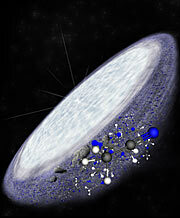 Importantly, the molecules ALMA detected are much more abundant than would be found in interstellar clouds. This tells astronomers that protoplanetary discs are very efficient at forming complex organic molecules and that they are able to form them on relatively short timescales . As this system continues to evolve, astronomers speculate that it’s likely that the organic molecules safely locked away in comets and other icy bodies will be ferried to environments more nurturing to life. This star is only about one million years old. By comparison the Sun is more than four billion years old. The name MWC 480 refers to the Mount Wilson Catalog of B and A stars with bright hydrogen lines in their spectra. ALMA is able to detect the faint millimetre-wavelength radiation that is naturally emitted by molecules in space. For these most recent observations, the astronomers used only a portion of ALMA’s 66 antennas when the telescope was in its lower-resolution configuration. Further studies of this and other protoplanetary discs with ALMA’s full capabilities will reveal additional details about the chemical and structural evolution of stars and planets. This rapid formation is essential to outpace the forces that would otherwise break the molecules apart. Also, these molecules were detected in a relatively serene part of the disc, roughly 4.5 to 15 billion kilometres from the central star. Though very distant by Solar System standards, in MWC 480’s scaled-up dimensions, this would be squarely in the comet-forming zone. This research was presented in a paper entitled “The Cometary Composition of a Protoplanetary Disk as Revealed by Complex Cyanides” by K.I. Öberg et al., to appear in the journal Nature on 9 April 2015. The team is composed of Karin I. Öberg (Harvard-Smithsonian Centre for Astrophysics, Cambridge, Massachusetts, USA), Viviana V. Guzmán (Harvard-Smithsonian Centre for Astrophysics), Kenji Furuya (Leiden Observatory, Leiden University, Leiden, the Netherlands), Chunhua Qi (Harvard-Smithsonian Centre for Astrophysics), Yuri Aikawa (Kobe University, Kobe, Japan), Sean M. Andrews (Harvard-Smithsonian Centre for Astrophysics), Ryan Loomis (Harvard-Smithsonian Centre for Astrophysics) and David J. Wilner (Harvard-Smithsonian Centre for Astrophysics).